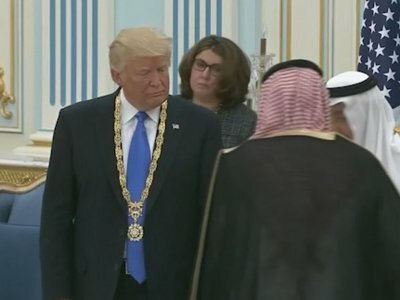 RIYADH, Saudi Arabia (AP) — Ignoring President Donald Trump’s past admonition, U.S. first lady Melania Trump did not cover her head Saturday when they arrived in Saudi Arabia on the opening leg of his first international tour since taking office. Two years ago, then-citizen Trump criticized then-first lady Michelle Obama’s decision to go bare-headed on a January 2015 visit with her husband. Under the kingdom’s strict dress code for women, Saudi women and most female visitors are required to wear a loose, black robe known as an abaya, in public. Most women in Saudi Arabia also cover their hair and face with a veil known as the niqab. But head coverings aren’t required for foreigners and most Western women go without. Hillary Clinton, on trips to Saudi Arabia as Obama’s secretary of state, also did not cover her head. Trump’s daughter, Ivanka, a senior White House adviser who is also accompanying her father, also left her head uncovered. Guardianship laws also require a male relative’s consent before a woman can obtain a passport, travel or marry. Often that relative is a father or husband, but in the absence of both can be the woman’s own son.